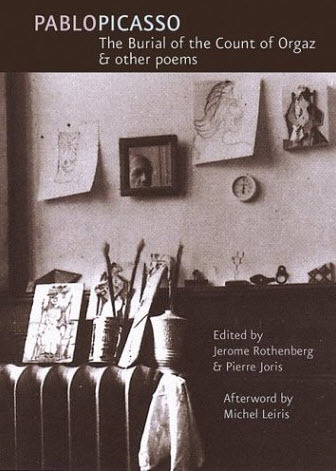 A collection of Pablo Picasso's Surrealist poetry can now be found in The Burial of the Count of Orgaz & Other Poems, coedited by Jerome Rothenberg and Pierre Joris. Like his artwork Picasso's poems were experimental and energetic. A short excerpt of one of Picasso's poems reads: "orange blossom jasmine cabinet perfumed with pine scent little sugar cube stuck sentry-like on point of bayonet drawn from his gaze and bleeding honey from his fingers on the dove's wings burning at lake bottom in the skillet of his eyes shows up exactly at the happy hour with its flower needle pin prick poised to touch the sea's snout blue bull winged incandescent spread out at the ocean's rim." In an article about the collection of Picasso's poetry the Christian Science Monitor writes, "The writings are unlikely to remake Picasso's image into that of a poet, at least in the conventional sense. His poems are not deliberate constructions of meaning, but rather rippling Surrealist wordplay." The authors of the book spent five years translating much of Picasso's poems. Picasso stopped painting and turned to poetry after an emotional crisis hit him at age 54. The book's editors says Picasso's poetry was admired by his contemporaries. Picasso also reportedly told a friend that he thought he would be remembered more for his poetry than his artwork. The Pablo Picasso poetry collection can be ordered here on Amazon.com.